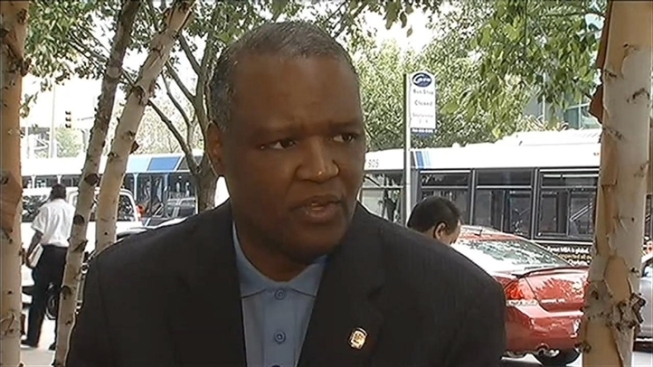 Prince George's County Executive Rushern Baker became the latest elected official to express grief at Friday's mass shooting in Newtown, Connecticut, which killed 27 people, 20 of them children, in addition to the gunman, 20-year-old Adam Lanza. "The images of the children, educators, and parents scurrying away from Sandy Hook School after yesterday's horrible event left an indelible mark on our hearts and minds," Baker said in a statement released Saturday. "Our thoughts and prayers go out to the families who lost a loved one to this cruel act of violence. As a father, it was heart-wrenching to see parents stand helplessly outside of the school waiting to learn whether their child was alive or not. We lost too many beautiful young lives that were filled with love and promise. And too many lives are now shattered because their children or family members are gone." Baker's statement was released on the same day that the Prince George's County Police Department held its third and final "Gift Cards for Guns" event Saturday. The first two gun collection events, designed to reduce gun violence in the county, yielded approximately 300 firearms. Our nation will never be the same after this senseless and terrible act in Newtown, Connecticut," Baker's statement concluded. "We shall never forget December 14, 2012. Nor will we forget the people who lost their lives yesterday. I ask the residents of Prince George's County to wrap their arms around the people of Newtown and lift them up with fervent prayers. For it is our prayers that will help to lighten the tremendous emotional burden that they will carry with them for the rest of their lives." The University of Maryland Police Department also issued a statement Saturday reminding students, faculty, and staff to report any suspicious activity or behavior to authorities. The University of Maryland's Black Student Union is holding a vigil for the victims of the Sandy Hook shooting at Nyumburu Ampitheater beginning at 7 p.m.